Chelsea vs. Leicester City : 18 March 2012. I awoke on Sunday, fearing the news. I was obviously concerned about the awful episode involving Fabrice Muamba at White Hart Lane but I had also heard on Saturday that one of my favourite uncles – Ken, from Vancouver – was also poorly. I gingerly flipped the computer on, waited for the gears to whirl into action and sat still. Thankfully, no news was definitely good news. However, there was a certain low-lying fog, not outside, but in my mind, as I scrambled a few things together ahead of my third trip to London in nine days. I was clearly finding it difficult to garner massive amounts of enthusiasm for this third game of the week. After the euphoria of Wednesday, I suppose that this was only natural. Just before I left for London, I quickly checked on the CIA website to see what was being said about the game with Leicester City. Oh. There wasn’t a thread about the match. I tut-tutted to myself and departed. Parky could tell I was a little bit low as I collected him at just after 9am. He started cursing me, I replied similarly and, by the time we had stopped off for our usual McBreakfast in Melksham, things had been restored to their normal equilibrium. Despite a little delay due to a road accident near Swindon, it was a decent drive up to London. Tuna – from Atlanta – was over for the week and was soon in touch. It’s always a pleasure to see him at HQ. Tuna plays a special role in my gradually evolving relationship with the burgeoning American fan base; he was, as I remember it, the first Chelsea fan in America I remember meeting at my first ever game in Pittsburgh in 2004. On that trip, I spent the day with friends from North Carolina and didn’t really mix with any Chelsea fans at all. In fact, to be honest, there weren’t many Chelsea fans present at Heinz Field for that match against Roma. Even the main Chelsea section only housed around 150. We watched behind one of the goals, in the front row, and if only I’d known how some of those Chelsea fans along the side would become friends over the following few years. At the end of the game, as we were walking underneath the stands, Tuna saw my Chelsea shirt and spoke to me. At the time, I wasn’t sure if he was an Englishman with an American accent, or an American putting on an English accent. I bumped into Tuna again in New York the following summer, but I still wasn’t familiar with too many of the fans Stateside. It was only when I joined up to CIA ahead of the Chicago trip in 2006, did I start to make major in roads into putting names to all of those faces. It has been a great ride ever since. The coffee was going down well and the banter was flying as we headed into Berkshire. With mild weather forecasted, we were both in our summer gear. With the chat finally stalling, Parky put a Jam CD in the CD player and the volume was cranked up. I have mentioned it before, but no band takes me back to my youth – of Chelsea trips in particular – like the Jam, in that 1978 to 1980 period especially. Working class heroes, singing about urban angst, the Jam struck a chord like no other band and were much loved by the football fraternity in that period. As I rose above the streets of west London on the raised section of the M4 motorway, memories of my childhood raced through my mind. My Dad used to take me up to London for matches at The Bridge from 1974 to 1980; by the time his car reached this section, my excitement reached stratospheric levels. Each few yards of tarmac throws up tons of memories…a massive traffic jam caused by Southampton fans on their way to Wembley on League Cup Final day 1979 when we got to Chelsea just in time for the kick-off, tooting the car horn after promotion in 1984, the first sighting of the Griffin Park floodlights to the right, the massive Chelsea / Adidas advertisement on a building in 2006, the Wembley arch to the left way in the distance, the famous Lucozade sign to the left, the old art deco Beechem building to the right, Canary Wharf, The Gherkin, The Shard in the distance, the grey hulk of Earls Court…Chelsea tantalisingly close now. This section of the M4, as it rises and turns, always gets my blood pumping. Long may it continue. Straight into The Goose at just before midday. The place was again rather quiet. Talk amongst my mates was mainly of the Benfica away game. As always, Rob seemed to have the best prices. I think he must have easyJet’s flight schedules from Stanstead and Gatwick memorised by now. I had a nice chat with The Fishy Boy, who is around for the games against City and Spurs, too. We chatted about mutual friends, the upcoming tour, and the CPO debacle. Everything but the game. You know the score. Jonesy and Jokka mentioned our game in New York in the summer and I am hopeful that they will be joining me. A couple of pints of Peroni and it was soon time to head off to The Bridge. I quickly bought a copy of “CFCUK” and the match programme. I noted that “CFCUK’ had an extra “Sheditorial” as the original was written just before AVB got the “Spanish Fiddler” two week’s ago. On page 41 of the programme, there is a lovely photo of none other than Cathy, with Roberto di Matteo, on the occasion of her fiftieth birthday. There was a large article about the 1997 F.A. Cup Final (thank you Robbie), but only a fleeting mention (in Johnny Vaughan’s column) about the iconic Chelsea vs. Leicester City replay (thank you Erland) in the fifth round that season. That was some night. I did my usual “check the East Upper for empty seats” routine when I reached the entrance to the MHU. Yep, there were hundreds empty in the corners. I had heard that tickets were still being sold to personal callers in the morning. Away to my right, the 6,000 away fans were already ensconced in The Shed. So, a question to Mr. Buck and Mr. Gourlay. On the back of our best performance of the season against Napoli, how come we can’t sell 35,000 tickets at only £30 a pop for the quarter finals of the F.A. Cup? And you say we have out-grown Stamford Bridge? Just before the teams came onto the pitch, I looked on with glee as the “upper tier” flag continued on past Gate 16, then Gate 17 and into the upper tier of the East Stand. It appeared to be seeking freedom as it went on unhindered, over the heads of the spectators who are not usually troubled by it. I quickly sent out a quick text to Steve and Daz, who are usually trusted to gather up the flag in the NE corner of the upper tier. It finally came to rest at the southern end of the upper tier. It reminded me of the original “Pride of London” flag which made its debut at a game before the Chelsea vs. Wolves F.A. Cup quarter final some 18 years ago. On that day, it began in The Shed and ended up travelling over the heads of us in the West Stand. At the end of that particular game, the flag ended up on the pitch, along with thousands of ecstatic Chelsea fans, enjoying the thrill of our first F.A Cup semi final in 24 years. I remember that Glenn and I ended up on the pitch on that Sunday afternoon in March 1994; it was the day that “The Blue Flag” really came into its own too. With F.A. Cup semi-finals coming to us in 1996, 1997, 2000, 2002, 2006, 2007, 2009 and 2010, I acknowledged the fact that a return to Wembley in April would be met with hardly a raised eyebrow, let alone mass hysteria and a pitch invasion. This is how far we have travelled and – I’ll be honest – it saddens me to the core that I will probably never again be as excited at reaching a semi-final as I did all those years ago in 1994. The game was over as early as the twentieth minute really. Chelsea got out of the blocks and had a couple of early chances. A Juan Mata corner dropped into the six yard box and Gary Cahill rose to head down and in for his first goal in Chelsea colours. He decided to race past the silent away supporters and head towards the family section in the East Lower. Not many goals are celebrated in that area of the stadium; I hope that the inhabitants of that section took a few rare photos. We were well on top to be honest, despite a few Leicester attempts on our goal. At the break, I had a few words with the chap who was sat alongside Alan. Gordon was from Yeovil, a fellow Somerset fan, and knew of a few of the local lads who I used to occasionally meet up with on the Yeovil supporters’ coach in the mid-‘eighties; all of whom still go, but I’ve not seen them for ages. The midfield dynamo of that mid-‘eighties team, Johnny B, was on the pitch with Neil Barnett, at the break. I never tire of seeing these Chelsea heroes of my youth. Attacking the Matthew Harding stand, we were rewarded with a flurry of chances down below us. Florent Malouda had replaced Juan Mata and forced Kasper Schmeichel to save down low. Unselfish play from Torres set up Studge, but he was annoyingly dispossessed after hanging onto the ball for an eternity. Studge was having one of those games. Torres then moved the ball nicely, but his shot was blocked. Michael Essien replaced Kalou and a goal soon followed. After a great performance against Napoli on Wednesday, Torres had been the star attraction against Leicester. 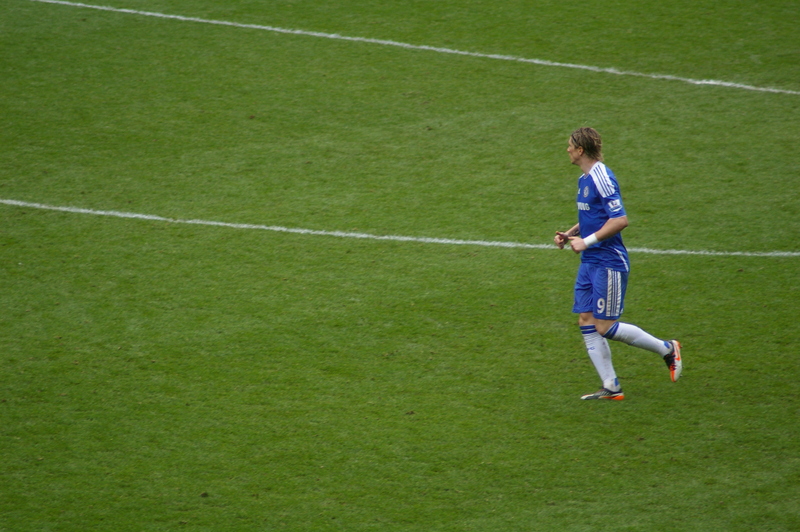 Meireles cleverly set up Torres who quickly and nimbly struck a shot goalwards. At last, he endured a little good fortune; the shot was not cleanly struck but just made it over the line, just inside the post, just beyond the despairing dive of Schmeichel Junior. At last. His latest goal drought was over. Phew. A firm shot from Nando flew over the bar just after. At the other end, the visitors forced a great save from Petr Cech. Then a shot from Dann ricocheted off the base of the post and Beckford slotted the ball in. There was a little anxiety in the Chelsea ranks. I took a photo of Raul Meireles as he clipped in an in swinging corner towards the near post. Who should be there to meet it, but the blond head of Fernando Torres. We looked on in amazement as the ball bounced down and in. This time, the celebrations were down below me. Click, click, click, click, click, click. I missed the second goal from the visitors; I am reliably informed it was a scorcher. With everyone in the stadium begging for Torres to shoot once he dribbled free, he unselfishly set up his compatriot Meireles, who slotted the ball in past the off-balance ‘keeper. On the drive home, news came through of our semi-final opponents. On a normal day, the chance of us playing Tottenham at Wembley would have elicited more of an emotional response. However, with the Tottenham / Bolton tie still undecided and clouded in doubt and possible sadness, I did not dwell too long on potential match-ups and possible days in the sun. This entry was posted in Season 2011-2012. and tagged 2011-2012, FA Cup, Fernando Torres, Flags, London, Pittsburgh, Roma by Chris Axon. Bookmark the permalink.